It is Spring break at my university, so it is the absolute perfect time to be sick (meant to be read in a voice dripping with sarcasm). Instead of focusing my writing this week on approaches to help us become more effective teachers or tools to enhance our productivity, I've got some recommendations for those of you who might be looking for a break from all that. Savvy, by Ingrid Law – Sean Michael Morris recommended this book back on episode #087. It is a delightful book for middle-age kids (and adults who love a captivating story). I'm so glad to know there's more to the story than just this first book. Spare Parts: Four Undocumented Teenagers, One Ugly Robot, and the Battle for the American Dream, by Joshua Davis – My colleague recommended this book and I knew I would enjoy it just from the title. It reminded me a lot of the hope offered in the book The Boy who Harnessed the Wind. Such a great adventure in learning and justice. We, the Economy – 20 short films you can't afford to miss – I found these videos while on a bit of a Twitter exploration. Morgan Spurlock is just one of the many talented directors who contributed to these films. The Mindy Project – I've also been enjoying binge-watching The Mindy Project on Hulu. Her narcissism is fun to watch and we can tell that deep down beneath, she really does care. TV: Last Week Tonight with John Oliver – While I have yet to find any students who watch The Mindy Project, many of them are regular viewers of John Oliver's show on HBO. Technically, most of them don't watch it on HBO and they don't watch the entire show. YouTube has the clips of his 19-minute monologues, including his recent dive into the encryption debate going on between Apple and the FBI. My next work-related book is going to be James Lang's latest book – Small Teaching: Everyday Lessons from the Science of Learning. He's on the Teaching in Higher Ed Podcast this Thursday, so keep your ears on your podcast player. It's a good one! I mentioned in a recent episode how much I'm getting out of using the Due App. As I started to find multiple uses for timers in my life, I ran into a challenge. As soon as the timer went off and I turned off the alarm, the item quickly went out of my head. I don't have that problem with the Due App. I set a “timer” and it keeps bugging me however often I tell it to… If I get distracted in the moments following a reminder to take care of something, I quickly get my attention pulled back by the next alert. Meeting with students. What I enjoy the most about teaching are the one-on-one conversations I get to have with students. That means that I frequently lose track of time and run the risk of missing something urgent. Now I set up an alert in the Due App for five minutes before our conversation is supposed to end and set it up to buzz me every five minutes after that. You have complete control over how often it will bug you. Committee meetings. I'm charing a few committees this semester and often have to squeeze the meetings in between my teaching schedule. I set a Due alarm for ten minutes before the meeting is supposed to end and then for each five minutes after that. Reminders to take / pick up students' exams that are being proctored by the disabilities office. I like to do blind grading for exams. That doesn't work very well if I don't have the students' exams with me who have had their exams administered by another person. I set a Due reminder to nudge me to pick up their exams from the office prior to me leaving the office and heading home. Then, I can be sure to grade their exams along with everyone else's. As I was researching stuff for this post, I discovered that there are also reusable timers as a feature of the app. They give the example of a Pomodoro timer that you might launch when doing a burst of productivity. Maybe you have a set period of time for each time you brew tea, or start a load of laundry in the washer? You can reuse the timers anytime you want to perform that activity that could use a set duration of time. There are so many possibilities that I know things are just getting started. I just bought the Due App for the Mac and look forward to syncing all my reminders between my Apple Watch, iPhone and Mac. I still have at least one of my planners from college. It's a comic-themed one. Each double-pages spread contains a Far Side comic on the left side and a week-at-a glance on the right. Life was simpler then. My weeks looked mostly the same, with the occasional exam or paper thrown into the mix. My to do list was kept in the same place as scheduled events, on the corresponding day in my Far Side comic planner. Things are so different for our students now. College students are studying less than prior generations, to the tune of approximately ten hours less per week. More than half of them work while in college. Then there's the 8-10 hours they're spending on their phones daily, according to one study. Here's how the BLS's American Time Use Survey shows that college students spend their time. To my knowledge, no one at my university has surveyed the sleeping habits of our students. It is hard to imagine that our average is higher than 7 hours a night, however. I hope to be proven wrong on that someday. It is more complicated for today's students to manage their time and their tasks than it was for me in college. How can we support our students' productivity? Some students are able to manage their lives in their heads. It depends on the types of classes they are taking and what's going on in the rest of their lives. However, all students benefit when we structure our teaching to grow students' abilities to manage their time and tasks more effectively. Here are some ways we can support our students' productivity habits. Most of the LMSs that I've used have some kind of master calendar for students to view all the assignments in their classes and their corresponding due dates/times. Some give the ability to copy/paste a calendar subscription, so that students can add it to whatever calendar they use (Google calendar, a Mac calendar, Outlook, etc.). Our university uses Moodle, which has this option. If students subscribe to a calendar with all their assignments in it, likely they'll be able to see it on their smart phone, as well as when they're on their computers. When Ken Bain was on the episode 36, he spoke about the importance of giving students feedback along the way toward the completion of a major assignment. Students have told me that my method of separating the research and writing processes causes them to be less tempted to take shortcuts. They also said it helped them learn the skill of researching and writing better by having them separated like that. By having assignments broken up into pieces, we model for our students to think about larger projects in terms of the action steps that it will take to move it forward to completion. On the upcoming episode 45 with Aaron Daniel Annas (link will work after 5:00 am PST on 4/23/15), he asked me how to set better boundaries with students who are in crunch mode with their assignments. I advise having assignments due at 5:00 pm, since that tends to reduce the likelihood that students stay up all night to get them finished. Our university has a freshmen class called Cornerstone that introduces them to the university, helps build study skills, and creates a community of learners to improve retention. One of the assignments most Cornerstone classes require is to submit their planners (or screenshots of their electronic system), with their schedules each week and each classes' assignments in it. Once the class is over, many students go back to the method of relying on their professors to remind them of assignments. I wonder if there isn't a better way for me to reinforce the continued discipline around having a planner or other means for tracking tasks and calendar items. I had a health issue come up this week that meant I couldn't teach on Monday, as planned. I'll spare everyone the details, but suffice to say once the medicine I needed kicked in, I knew it would only be a day or two of recovery time. It got me thinking about the tools I'm grateful for, when things don't go quite as I've planned. No one likes being sick, but it sure can be easier to recover when you know that things aren't as likely to fall through the cracks. The first thing I did when I knew I wouldn't be able to teach on Monday was to send a message out via Remind. This free service allows me to keep my cell number confidential, but have all the conveniences of a one-way text messaging service to my students. Sign-up is easy on all sides (for students and faculty). I wrote a more extensive review back in 2014. They recently enhanced their feature set by adding the ability to chat with individual students back and forth. If you would prefer to keep the communication one-way, as you have been doing, you don't have to activate this setting. However, the ability to set up office hours makes it such that you can control exactly when students can initiate chats with you, or even make it only available to students that you initiate chats with… If you have more questions about how the new chat feature works, check out their FAQ. Over these two weeks, I've been meeting with all the students in my Principles of Marketing classes. I had a few meetings scheduled for the afternoon that I really didn't want to postpone. That would only mean that the students wouldn't receive feedback on their progress on their marketing plans until quite close to when it is actually due. I wound up scheduling conference calls with them on the FreeConference.com service. The company makes their money by charging for extras like call recording. If all you want to do is have a call, it's free. There were some students who preferred to wait until I was back on campus and we could meet in person. My scheduling tool, TimeTrade, made this process simple. I went to my list of appointments and clicked on the one for the group wanting to wait until next week. There's a reschedule option there that automatically sends a link to the student who scheduled the meeting, initially, and gives them a little nudge to remember to find a suitable time to reschedule. The tool I use to schedule all my class sessions is called PlanBook. It is available on Windows and the Mac, in addition to on the iPad. You can review what I wrote about Planbook in the past, as well as check out all the features. Planbook made it easy for me to see what my students would be missing, since we didn't have class on Monday. I could reschedule the remaining class sessions for the semester and easily get handouts and changes to them via the free Planbook Connect website that you publish with the Planbook software. I actually wound up working most of the day, despite not feeling well. The afternoon conference calls went well with the students. I was also able to write the remaining exams for the rest of the semester, using Cengage's exam creation software. However, in the evening, I did indulge in an attempt to get caught up with Mad Men. I got through two episodes of season 7 and am on my way to being able to join all the chatter on social media about season 8. I met with a student yesterday who was completely overwhelmed. She used to be a faithful user of a paper planner, but had not used it this semester and was feeling the consequences. The student had come to the conclusion that while she might often be able to carry everything that needed doing around in her head, that any “change in plans” threatened to bring her whole system down. An illness earlier in the semester had thrown her off in most of her classes and she was having trouble getting away from constant chaos. Of course, it isn't just our students who can get overwhelmed. One of the truest stereotypes that so many of us academics have earned is that of the absent minded professor. The practices recommended by experts in learning design can seem impossible to pursue, since just keeping status quo is hard enough. I've just started reading David Allen's revised Getting Things Done: The Art of Stress-free Productivity. He shares in the first chapter about what has changed since he first wrote the book and what is still the same. If you're not familiar with the Getting Things Done system, this is a good overview. Additionally, Dave (my husband) recently interviewed David Allen for his Coaching for Leaders podcast. Get it out of your head. Our brains are not at their best when we try to carry our to do lists in our minds.By having some proactive and reactive means of capturing all that is coming at us, or otherwise occupying our thoughts, we can more easily tap into our creative capabilities and experience less stress. Separate the processing from the doing. When we are going through our various inboxes to sort through our tasks, we need to avoid the temptation to try to actually start tackling them.If a task requires less than two minutes to accomplish, it is ok to go ahead and get it done. However, those actions that require more time will be better served if we consider them in the context of everything that needs doing. Get better at saying no by allowing time for reflection. If we are simply “doing” machines, we lose the opportunity to cultivate those activities that provide the greatest meaning for us in our lives. If our system for managing our time and tasks includes reflective thinking about our dreams, goals, and priorities, we gain the courage and confidence to say no to things that aren't aligned with our sense of purpose. Only use due dates for actions that truly have due dates. I used to carry a Franklin Planner with me everywhere. I relied on it heavily to keep me organized. One faulty part of my approach, though, had to do with deadlines.Theoretically, if I didn't get enough done in one day, I should have copied the tasks to the next day's page. That quickly became tedious and I would have to do lists that I was consulting from three weeks ago, since I hadn't taken the time to copy them over to the current page. It can be that same way with electronic task list item due dates. We tell ourselves that it is due by this Friday, because there's a sense of urgency around it. however, if we don't get to it by Friday, we either reset the due date, or have a growing snowball of overdue tasks.Our productivity approaches should be ones that we trust. If we regularly look at outstanding tasks, we can prioritize as we go which ones are most important to us. That helps us avoid putting due dates on things that we no longer trust, since we know that so many of them aren't actually due on the day we say that they are. Invest time each week considering what's most important in the coming week. I perform a weekly review at least 75% of the time. The weeks when I'm disciplined enough to go through this activity, there's a noticeable difference in my stress levels and my productivity. I've decided, in advance, what is most important to focus on during the week and made any contingency plans for areas where there may be trouble ahead. One of the chapters that David Allen added to the revised version of Getting Thing Done is a section on personal mastery. We don't ever “finish” GTD, but rather are continually developing and adapting. People with a high level of personal mastery are able to consistently realize the results that matter most deeply to them–in effect, they approach their life as an artist would approach a work of art. The do that by becoming committed to their own lifelong learning. We don't someday wake up and completely follow a system like GTD every day of our lives from then on out. Instead, we continually strive to incorporate habits into our lives that will maximize our effectiveness and cushion the blows when times get tough. I enjoyed the conversation with Natalie Houston immensely, which aired this past week in episode #034. She reminded us all to find ways to have more of a sense of ease in our lives. Since the conversation with Natalie, I've been setting timers like crazy. While I had used this approach previously, she shed new light on the practice and inspired me to take more regular advantage of the focus on the moment. @rgfeal set timer for one minute; close eyes and breathe. Then ask yourself: what should I do next? Write down whatever comes up. Then act. I met with a few students this week and really felt more connected with the conversations in those times when I remembered to set a timer. There was one time when I neglected to do so, and I both wound up completely throwing off my schedule for the latter part of the afternoon, and wasn't as engaged as in the other “timed” conversations. Natalie also offers these tips about using a timer while grading. This one is really more for my doctoral students than for me, though I treasure the opportunities to bring more ease into other people's lives. As a part of their program, they're asked a number of times to develop an annotated bibliography. We also strongly encourage the use of the citations manager, Zotero. The annotated bibliography assignment hasn't aligned well with using the automated features in Zotero, since until now, I thought it could only “spit out” a list of sources, not something that included annotations. Thanks to Emory Libraries and Information Technology, I found out I was wrong. Turns out, you can create a custom style in Zotero, or download one from their repository and leave the heavy lifting to others. I never realized that I was “different” until my friend showed such an interest in how I organized my files and folders for my academic life. My Mom was always a person with a fond appreciation for file cabinets and keeping articles of interest around various topics. She definitely passed that on to me. Now, neither of us wants that many physical files cluttering up our home. However, since storage space on our hard drives and/or in the cloud is relatively inexpensive today, it makes sense to hang on to stuff, in case it winds up being useful in the future. The search features on computers today are so robust, that you could argue that having a good folder structure is no longer necessary. Some time ago, I trimmed the number of folders in my email program, so that I didn't have to scroll through so many when I was looking for something via my iPhone. However, I still find it helpful to have a basic system of folders on both email and on my hard drive to accommodate those times when search doesn't get me what I need. This folder contains data related to a specific semester. For 2015s, I have my class rosters (which are also sign-in sheets), my schedule (which gets printed and hung up outside my office), and a folder for students' work in each of my classes that semester. In addition to the schedule that hangs on my wall, I create my version of Michael Hyatt's ideal week template. This exercise enables me to see how I want to invest my time throughout the semester and identify any barriers, in advance. I spoke about how I use the ideal week template on episode 23 of the Teaching in Higher Ed podcast. Inside each of the semester-class folders will be the students' work, as the semester gets under way. As I begin a new semester, I move the previous semester's folder into a directory named z-Archive. The naming convention on that folder allows for it to be listed at the bottom of my main university folder, since I don't need to access it often. When you move a folder (to an archive folder, for example), any links that you provided to students for feedback are then broken. That's why I wait until a few weeks into a new semester prior to moving/archiving the folder. This folder has directories for each of the classes I have taught previously. The PowerPoints, exams, and other class resources are kept in the folders. The publisher materials also go here, though I tend not to keep archives, since much of the information is redundant and some of the files are quite large. Note that the name of the courses folder begins with a 1-. Since I spend so much time in the semester-specific folder and the courses folder during a given semester, it helps to have them appear toward the top of the list of items, so I can get to them quickly. Within the 1-courses folder is also a folder called z-Class ideas. This has course descriptions for electives that I have proposed previously, as well as class resources for courses that I was potentially going to teach down the road and needed a place to hang on to such materials. On the Mac, there's a favorites list over on the left-hand side of each finder window. I keep my most commonly used folders there, including my semester-specific and course-content folders. On the PC, you might consider using aliases, which let you create a link that takes you to the folder, which you can then place wherever you want to have easy access. Punctuation was never meant to be any part of a file name. While some operating systems allow for punctuation better than they previously did, it still isn't a good idea. Somewhere down the line, your file could encounter a system that doesn't like punctuation in file names and you may not necessarily catch why the error is occurring right away. It can be a big help if the students are told what to name the files that they submit for your courses. Yes, they may forget, and you will still need to tweak some of them. However, most of them will remember and it will save you that much more time in your grading process. It is a tough time of the semester. The grading pile is stacked high (in my case, virtually). Energy levels are low (my whole family just spent the last few weeks passing an illness to each person who lives in our home). While this is not my favorite time of the year, I do have a few techniques I use to bring a little life into my days and to keep myself plugging along. While I don't typically adhere to a strict Pomodoro technique, I do try to remember to take a break every hour. My wrists are really bad, too, so I incorporate stretching in as often as I can into those breaks. NPR is a great source for finding music for every desired mood. If you need a reminder to avoid worry, Playing for Change has this great version of Don't Worry Be Happy. If you need a good laugh, Weird Al Yankovic has a great grammar-related spoof called Word Crimes that is perfect for all the grading we're doing this time of year. Sometimes it can seem like we aren't getting anywhere. I follow my Mom's advice from when I was a kid and would get overwhelmed. She recommended that I create (or revisit) a list of everything that needed to get done. Then, I could prioritize the most important item on the list and get moving toward done. I use OmniFocus for tracking all my tasks, which really helps me feel like things won't slip through the cracks during the busier seasons (or, at least I'll know that they have been missed, if I am not able to get to everything). I also like to break tasks like “grade business plans” down into even smaller tasks and have a visual reminder on my monitor of how much further I have to go. Each time I finish grading a business plan, I remove the sticky note from the bottom of my monitor. That process gives me a visual indication of just how far I've come and how much there is left to grade on that particular piece of the virtual pile. Walter Mischel, the researcher responsible for developing the marshmallow test, reminds us of the importance of self-discipline and delayed gratification. I find that when the temptation to stop what I'm working on and to “eat” my marshmallow early starts to crop up, it helps to have already considered what reward I will give myself when I've accomplished the end-of-semester tasks. As geeky as this is, I think for me it is going to be to dive in to watching videos on how to learn OmniFocus better and also to start playing with the CATME tool, introduced to us by Dr. Chrissy Spencer in episode 25. Many of us are getting ready to launch into a new semester later this month, or in September. As I look to enjoy these last few weeks of summer, I'm also starting to get organized for the Fall. One of the big principles asserted in David Allen's Getting Things Done is the importance of having a regular “dump” of what's in our brains into some type of capture system. Some of his process of capturing what's on our minds happens in a somewhat prescribed manner, where we look at what projects are on our plates and what next actions relate to each of them. He also has some great trigger lists, where we can read through a list that is designed to trigger our minds to think about stuff that needs doing. The second method of capture recommended by Allen comes more in the moment, as we remember something that needs to be addressed. I have a few apps that I use when capturing what's on my mind and getting it recorded somewhere. Each of these apps is located on my home screen, so I have easy access to it. I have written previously about using checklists to maximize my efficiency in class planning. The Chronicle of Higher Ed has had posts regarding this topic, as well, with this one being a terrific introduction to the topic. My semester checklist continues to evolve, so have hesitated sharing it here. However, I passed it on to a few of my colleagues and they said it was quite beneficial, even though they modified it considerably for their own use. Here is my work-in-progress class planning checklist on Evernote. In order to boost my productivity even further, I take a condensed version of the checklist and import all the items via a single email to my task manager tool of choice (Remember the Milk). The comments about each item in the checklist don't need to be repeated in my to do list, but I have left them there mostly for the colleagues who I have sent the list to in the past who might benefit from the additional detail. RTM allows you to import a whole series of tasks in a single email, For tasks that repeat, based on the number of classes that I teach, I enter a separate task for each course (for example, revising and posting a syllabus needs to happen for each class). For items that only occur once per semester, such as updating my CV and re-posting, I only include a single task. Here is my also-work-in-progress Remember the Milk task list import email. If you want an entirely different example of what an academic in a scientific field keeps in mind as he develops his to do list, see this post from drosophiliac.com. Feel free to comment below on any of the many items I'm sure I have missed on my ever-changing checklist. This is my second year using it and I've already made a bunch of changes from last year. I'm looking forward to hearing from you on how to improve it even more. I'm preparing to give a session on productivity for our faculty in the Fall. The first challenge I have is trying to come up with a name for the talk. The term, productivity, tends to come with its own set of challenges. It can bring to mind the idea of trying to gauge some type of return-on-investment model for faculty's work. Those of us who see this work as a calling don't tend to enjoy having our efforts reduced down to a set of inputs and outputs. Like much of academia, our community is full of diverse perspectives and approaches to what is often referred to as personal productivity (“personal,” as opposed to team or organizational efficiency and effectiveness). More of us professors are carrying around smart phones these days, though there are still a few who communicate exam grades by posting spreadsheets on their office doors with student ID numbers and the respective earned points. Many of us lament about how distracted students are when using laptops in class, while others expect the entire class to be “wired” throughout all the class sessions. There's even the claim that our brains are getting addicted to the internet, though fortunately, there's also a prescribed cure. My Mom was one of the longer hold-outs I know of in my life who kept carrying a paper calendar and to do list with her. She does search and rescue with her dogs and this practice started to become increasingly challenging as slips of papers that contained important tasks or phone numbers wound up being inadvertently left on the side of a hill somewhere. She was vigilant about using electronic equivalents, since the syncing processes of the past were complex and unreliable. When my husband and I introduced her to the Mac and she realized how easy it now was to sync her calendar, to do list, and contacts between all her devices, she left her paper forms of organization behind forever (well, except for password management, but we are working one step at a time with her). Any system of organization must be able to be carried with us at all times. Our personal and work lives are too intertwined (especially as faculty members) to have separate systems for each aspect of our lives. Any new tool that I add to the mix needs to be simple to use, at least to get started. I tend to be an early adopter on most things, though I recognize that I am in the minority. My approach now is to always use tools that are simple to use, at least to get started using. One area where this has been demonstrated in the tools that I use is with the task manager called Remember the Milk (http://www.rememberthemilk.com). It is a web-based tool that also has the requisite apps for various smart phones (including iOS and Android devices). Getting started is as easy as creating an account and starting to enter tasks. As I have discovered more about the tool, I have improved upon the most obvious of features and adjusted my uses. This simplicity factor is illustrated well in the growing popularity of the iPhone/iPad app called Drafts. On the most basic level, this app opens a blank document every time you open it and gets you started on your intended task (writing something) in the fastest manner possible. Once you learn more about the app and grow in your comfort level, you can create all sorts of shortcuts, or make use of creative solutions that have been developed by others who also use the app. I am in the process of incorporating Drafts into my workflow. As I consider whether or not to add something new to my toolkit, I have taken to asking two questions. First, I want to know the primary intended purpose of the tool. Then, I want to know if I can figure out how to easily perform the intended purpose without reading any instructions or watching any tutorials. If the answer to the second question is yes, then it is ready to move into more careful analysis of whether or not I will find it to be a beneficial part of my personal productivity toolset. I'll be the first to admit that this is the one that I have the most trouble with. I have been known to invest hours of time into something that realistically won't save me but a few minutes a month. Sometimes, my supposed time-saving approaches wind up with me in the negative side of the calculation. Fortunately, someone else has already done the math for us, in order to determine if investing the time is going to ultimately be worth it or not. 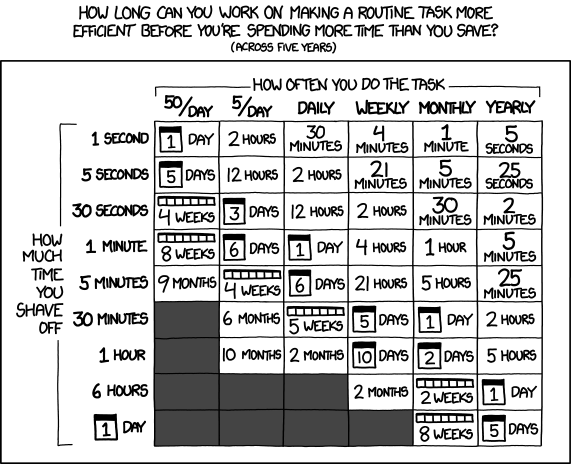 xkcd.com is a site that offers webcomics of “romance, sarcasm, math, and language.” In this comic, they use math to illustrate just how long we should spend on making a task more efficient before we have invested more time than it is going to save us. Remember that the little stuff can really add up. Take something we do as frequently as copy and paste on our computer. Is there a way you can tweak your approach to that task to save you time in the long run? I started using the TextExpander application on my Mac a year ago. It is a tool that allows you to store frequently-used text, graphics, or other pieces of data and create a shortcut for entering it. With students, I find myself answering the same questions repeatedly. TextExpander allows me to save those FAQs and only have to type a few characters and then have the short text get expanded to the series of paragraphs that contain my answer, for example. Students contact me often about internships, as I am the instructor of record for that course. I type in the letters VU, followed by the word internships, and the introduction to how the course is taught, followed by a website link gets entered into the email. They even have an iOS app, so that I can use the same commonly-used text “snippets” on my mobile device. Since I have invested so much time and effort into finding systems that work well for me, anything new that gets added into my tool set needs to be complementary to others that I use. Any applications that require syncing services should use Dropbox, or at the very least, iCloud. Learning curves can be significantly reduced when the systems you use work with one another. Evernote has been becoming more of a central tool in my organizational toolset, particularly given the large number of apps and devices that work with it. My latest LiveScribe pen saves its pencasts inside of Evernote. My preferred hand-written note-taking app links with Evernote. As I indicated above, I'll soon be incorporating Drafts into my workflow and it can send to Evernote, including specifying the notebook to send it to and what tags and other metadata to add. How about you? What characteristics do you look for when deciding if a tool is going to be integrated into your workflow and approaches? Are there any other tools that I didn't mention that fit into the characteristics of being simple, time-saving, and complementary? Everyone enters the “contest” of who is the busiest at some point in their lives. As someone who is a Mom of a 14 month-old, a full time professor, a person who subscribes to 121 RSS feeds (RIP in June, Google reader), and who can't wait to learn what's happening in the world of Mad Men, I know the value I place on time savers. Michael Hyatt's recent podcast on the tools that he uses to support his work inspired me. After almost ten years in higher education, I have certainly had my share of successes and failures when it comes to tools that I've used in my role as a professor. WHAT'S IN MY BAG? [Read more…] about What's in my bag? I've been on maternity leave this semester, loving the time I get to bond with our first child. As I think toward next semester, I'm working toward preparing for classes more effectively than I ever have before. I'm going to be teaching a full load and want to also continue to invest lots of time in our son's life. We all start out with the best of intentions, but somehow the year is underway before we know it, and we're again buried in papers to grade and classes to plan. I have spent an inordinate amount of time organizing my iPhone apps and tweaking my systems in the hopes of having my most organized and productive year yet. Here's to hoping that some of my recommendations will help you start the school year organized using your iPhone. Before iPhones and other technological advances, we had a basic set of organizational tools, all of which are now available in digital form. Until I read David Allen's Getting Things Done, I used to think that I could only have one physical in-box. I would feel guilty that stuff would wind up in my laptop bag, in my purse, and all over my desks at Vanguard and at home. After digesting Allen's recommendations, I discovered that I could have as many in boxes as made sense; I just needed to process what was in them each day and to separate thinking about what needed to be done from the actual doing. My iPhone has its own set of in-boxes that I go through regularly. My many email accounts show up on the phone and for anything that takes less than two minutes to do, I respond to them and either delete or archive them, aiming for an empty in box on all accounts at the end of my day (this is referred to by time management gurus as zero in box, which you can find a lot about on the internet, but I've found the 43 Folders site to be a good place to start). Emails that contain actions that will take more than two minutes to complete are emailed to my one central in-box: Remember the Milk. Remember the Milk is my favorite task manager – and trust me when I say I've explored many of them. I can access my to do list on my iPhone (regardless of whether or not I can get a connection to the internet at that time), over the web, as well as in print (I don't use their print features, but a friend at work likes to have a hard copy to doodle on throughout the day to help her stay focused and she loves the design of the printouts). As indicated above, I can also forward emails to my to do list, including some added text to indicate which folder/list I want the tasks associated with, when they are due, and how they should be tagged (tags let you categorize things in different ways; so you might have tags around where you need to be when you complete a task – such as @computer or @phone, as well as what activity they relate to – such as prep, grading, or research). My students' grades are all tracked on our university's learning portal. Careful consideration as to where to store student grade info can be important, as there are laws that protect students' privacy and you wouldn't want an ill-intentioned person to locate your iPhone and have the ability to access this sensitive information. However, I will be using the Attendance iPhone app starting this Fall, in conjunction with the rosters that contain the students' hand-written signatures. I keep a table up front of my classes that contain any handouts / cases we will be using that day, the set of clickers we sometimes use to reinforce the learning, as well as a roster for them to sign to verify their attendance. Before I leave the classroom after teaching each class, I will update the attendance app on my iPhone and have a growing digital record of their attendance. The application lets you individually email a student with their attendance record to date, export your data to archive somewhere besides your iPhone, and has some automation and customization features that are intuitive and innovative. The iPhone has a great built-in calendar that easily syncs to Outlook 2007 (my calendar of choice) and Mac's calendaring system (my husband's calendar of choice). I use the built-in calendar for my personal time management planning, but when I want to see my husband's calendar, I view our shared/synced Google calendars using an iPhone app called Calengoo. Syncing is simply a way of having the same calendar, no matter what you're using to view / edit it. If I make a change on my iPhone calendar, that change gets reflected in my Outlook calendar. We use a combination of two syncing systems: one that automatically syncs our desktop calendars with our iPhones (so we can avoid having to plug our phones in to do our syncing). We use Apple's Mobile Me service to accomplish the syncing between our iPhones and our desktop calendars. Apple makes this process very easy and the same syncing process works with contacts, too. We also do another form of syncing: One that syncs our respective desktop calendars to our Google calendars. Our program of choice here has been GooSync. It works well and we have experienced no problems with this solution, though I must admit that I haven't explored the other options that are available. The old paper-and-pad solution can also be implemented on the iPhone, though I must admit that I still feel rude if I'm tapping on my iPhone taking notes on a meeting. I might be suspected on paying much less attention than I am (or I'll be tempted to pay less attention because the other fun parts of the iPhone call out to me). For most meetings, I still take notes on paper and then record any actionable items into my iPhone. I'm looking forward to trying out my LiveScribe pen this year for capturing notes digitally, so I can balance the desire to demonstrate that I'm focused on the meeting, while still being able to be as close to paperless as is practical. I have really benefitted from using Evernote to take a picture of any white board brainstorming or mindmapping that occurs in meetings. Evernote is a notebook program that, like many other web 2.0 applications, is available on your iPhone, on the web, and on a desktop program solution. After a whiteboard-using meeting, I fire up the Evernote iPhone application and take a photo of the brainstorming we did. Later, I can email the photo to the attendees and also have it on my Evernote notebook for storing and future searching. Evernote is so smart, that it can search text in photographs, even hand-written text. I'm only skimming the surface of the potential for organization that Evernote offers. For more ideas, see their recent blog entry on 5 Ways Evernote Maximizes Your Organizing Potential. On an upcoming blog, I'll review the new iPhone 4.0. For now, let us know in the comments what tools you find most useful on your iPhone for keeping us academics organized.